Learning about grammar can be fun! Nouns Say “What’s That?” – Joyce's mystery and fiction book reviews with some non-fiction too! This book provides an excellent and entertaining introduction to nouns. Three colorful cartoon characters represent Person, Place and Thing. On a trip to the museum, they teach children about themselves and what they stand for. 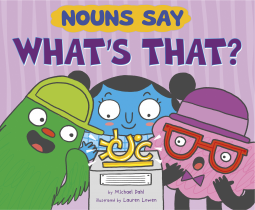 This book covers what nouns describe, plural nouns, proper nouns, irregular plural nouns and more…all while making the learning fun and providing sufficient repetition to solidify a young student’s understanding. A good addition for your grammar shelf. Thanks to NetGalley and the publisher for making learning colorful and fun. The opinions expressed are my own.